Fortnite is arguably the biggest game in the world right now. It certainly feels like it is. Nearly everywhere I look I see kids doing Fornite dances, ads for the game, people streaming the game and even Halloween costumes. But it also seems like most folks are focused on Battle Royale and not the other mode found in Fortnite, Save The World. Which I think is a shame. Save The World is really good and I think more people should play it. The basic narrative setup of Save The World is that a giant supernatural storm has wiped out most life on Earth, leaving few human survivors and millions of deadly enemies called Husks. It is now up to players to help save these desperate survivors, destroy the Husks and end the storm. Save The World spreads its narrative across a few different zones, each filled with missions, side quests and collectibles. A lot of missions in Save The World are about finding a spot on the map, building up around that spot and defending it from enemies for a period of time. But each map is randomly generated, making each mission feel different and helping the game feel less repetitive. I was also surprised by the the writing which is often funny. The cast really helps too. The game features talented actors like Dave Fennoy (Lee in The Walking Dead), Ashley Burch (Aloy in Horizon Zero Dawn) and Tom Scharpling (Greg Universe in the TV series Steven Universe). The actual gameplay loop in the missions is strange and it took some time before I fully understood what was going on. When you start a mission, you and any friends you are playing with spawn into the randomly generated world. At this point you can locate your objective and start the mission immediately. But this isn’t what you should actually do. Instead you’ll most likely spend 30 minutes or more exploring the map, collecting resources, completing smaller random events and killing enemies you encounter. And you’ll do this alone, as your friends will probably want to explore other parts of the map or will need different materials than you. So it’s a co-op game where you spend a good chunk of the mission not working together. Which is odd. Once everyone is finished doing what they wanted to do, you’ll head towards the objective and start building together. Figuring out the best way to defend yourselves and working together to hold off hordes of dangerous monsters and zombies. And this part of the mission demands a lot of teamwork and communication. Making sure everyone is on the same page and calling out boss enemies and other threats is key to surviving harder missions. Teams also need to use their different class abilities effectively, like the constructor who can strengthen buildings and heal walls. This mission loop was weird to experience at first and it took my girlfriend and I several missions to collectively wrap our head around the idea of splitting up and doing things alone in a co-op game. But once we figured that out, we started having a ton of fun. It has become our most played game together. This is because there is just a lot of stuff to do and collect in Save The World. Hundreds of weapons, traps, characters and more. New missions every day, new quests and challenges. Every time I log into Fortnite Save The World, I feel like I have a huge new checklist of content to do and see. It also helps that Fortnite has solid combat controls and building mechanics. A recent update also made it a perfect time for new players to jump into Save The World. The update redesigned menus and upgrade systems, making it easier to actually figure out how to level up guns or modify character abilities. The biggest reason why a lot of folks haven’t played Save The World is that players have to pay to gain access to this co-op mode. 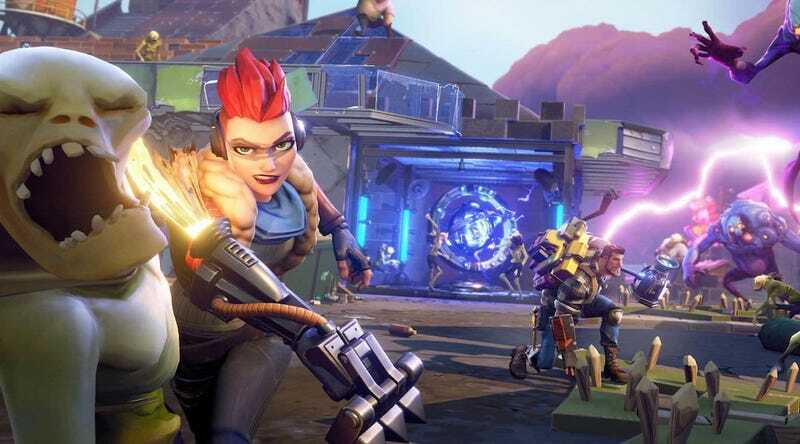 Epic has promised Save The World will go free-to-play, but has continued to delay this change. So for now players will have to fork over about $40 before they can start saving the world. This isn’t cheap and for many this will be a deal breaker. But Save The World goes on sale fairly often, usually for below $30. You can also earn V-Bucks while playing, which you can spend in Battle Royale. Even at full price, I think Save The World is worth the price of entry. It’s a co-op game filled with loot and new events that you can play with friends, regardless of what platform they are on and it has missions that cater to both die hard lone wolves and co-op loving heroes. If you need a break from Battle Royale, Save The World might just be worth a shot.